Idyllic England is wrapped up in the Cotswolds. Welcome to this very special, wonderfully picturesque region. Defined by its rolling hills, or ‘wolds’, this glorious region runs through five counties – Gloucestershire, Oxfordshire, Warwickshire, Wiltshire and Worcestershire – and offers a host of activities and attractions. In all seasons, too! Explore quintessential villages of honey-coloured stone; take in splendid market towns; visit some of the country’s greatest palaces and country houses; marvel at the natural world in acclaimed reserves and at some of the most famous Arboretums in Britain; walk through breath-taking landscapes along historic trails. Historic woodlands, offer lovely walks for bluebell spotting and in late spring and summer, the herbaceous borders at Hidcote Manor, Snowshill Manor and Bourton House Garden will surprise and delight. Kiftsgate Court and Sudeley Castle’s Queens’ Garden - named after the four English queens that walked within – become beautifully fragrant with roses. When summer turns to autumn and the trees take on a golden hue, dramatic colours can be seen throughout the ancient beech woodlands of the Cotswolds. Hidcote - Hidcote is an Arts and Crafts garden in the north Cotswolds, a stone’s throw from Stratford-upon-Avon. Created by the talented American horticulturist, Major Lawrence Johnston its colourful and intricately designed outdoor ‘rooms’ are always full of surprises. It’s a must-see if you’re on holiday in the Cotswolds. Kiftsgate Court Gardens - Kiftsgate Gardens are one of the hidden treasures of the Cotswolds that lay a stones throw away from the more famous Hidcote Gardens. If you have the choice choose Kiftsgate, especially in July, when the roses are in full bloom - you will be awe inspired. Kiftsgate is even more spell bindingly magnificent! and all down to three generations of women. Highgrove - Highgrove is the private residence of TRH The Prince of Wales and The Duchess of Cornwall, near Tetbury in Gloucestershire. Since 1980 when the Prince of Wales first arrived at Highgrove, His Royal Highness has devoted much energy to transforming the gardens around the house, which are now renowned as some of the most inspiring and innovative in the United Kingdom. Mill Dene - Mill Dene is a romantic story of a young couple falling in love with each other and a beautiful Cotswold stone water mill. Sezincote - Sezincote is unique. At the heart of a traditional, family-run estate covering 4,500 acres of rolling Cotswold countryside stands a 200-year-old Mogul Indian palace, set in a romantic landscape of temples, grottoes, waterfalls and canals reminiscent of the Taj Mahal. There is so much history to take in that you’ll be sure to find a story that rewards your interests. 'Cotswolds' is a combination of two very old English words. Everyone is pretty much agreed that 'Wolds' are gentle hills, and most people agree that 'Cots' are sheep enclosures. So 'Cotswolds' probably just means an area of gentle hills with plenty of sheep around. Sudeley Castle - Located in the heart of the Cotswolds, Sudeley Castle & Gardens has played an important role in England’s history for over 1,000 years. Outside, the castle is surrounded by a breathtaking 1,200 acre estate and ten award-winning gardens. The centrepiece is the Queens Garden, so named because four of England’s queens – Anne Boleyn, Katherine Parr, Lady Jane Grey and Elizabeth I – once walked upon the original Tudor Parterre. Snowshill Manor - Snowshill Manor is a Cotswold manor house packed with extraordinary treasures collected over a life time by Charles Wade. Blenheim Palace - Blenheim Palace was built in the early 18th Century to celebrate victory over the French in the War of the Spanish Succession. 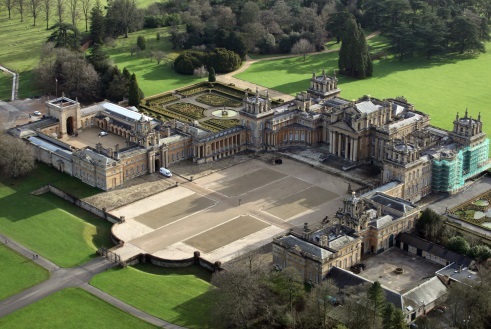 In particular, it was built as a gift to the 1st Duke of Marlborough, John Churchill, the military commander who led the Allied forces in the Battle of Blenheim on 13th August 1704. Chastleton House - By remaining within the same family for much of its existence, Chastleton has been able to retain its unique spirit and collection being affectionately called a time capsule and treasure trove. With little intrusion from the modern age, you can literally feel like you are stepping back in time as you enter the front door. Kelmscott Manor - Kelmscott Manor was the inspirational Cotswold retreat of William Morris and his family, friends and colleagues. When Morris first saw the Manor in 1871, he was delighted by this 'loveliest haunt of ancient peace'; he signed a joint lease for the property with his friend and colleague Dante Gabriel Rossetti, the Pre-Raphaelite artist. The Cotswold hills are crisscrossed with dry stone walls, this picturesque landscape is completed with hidden river valleys and distinctive market towns and villages made of the famous Cotswold stone. Many Cotswold villages have enigmatic names such as The Slaughters, Stow-on-the-Wold, The Oddingtons, Ampney Crucis and Guiting Power. Broadway - The image of Broadway today remains as it has done for centuries; a charismatic spectacle of rolling wolds, overlooking a gathering of ancient honey coloured limestone period buildings with orderly horse chestnut trees lining the grass-fringed verges of the historic 'broad way' High Street. Bourton-on-the-Water - Bourton-on-the-Water has been described as the 'Little Venice' of the Cotswold's and is one of the most popular tourist spots in the region being serviced by the many shops, café's, and attractions. Stow-on-the-Wold - Stow-on-the-Wold is a delightful market town (population circa. 2000) and along with Moreton in Marsh, perhaps the best known of the small Cotswolds towns. Stow-on the-Wold is the highest of the Cotswold towns standing exposed on 800 feet high Stow Hill at a junction of seven major roads, including the Roman Fosse Way. Chipping Campden - Chipping Campden is one of the loveliest small towns in the Cotswolds and a gilded masterpiece of limestone and craftsmanship. The main street curves in a shallow arc lined with a succession of ancient houses each grafted to the next but each with its own distinctive embellishments. Stanway & Stanton - A pair of pretty Cotswolds villages set just one mile apart south of Broadway in the county of Worcestershire. Hidden gems set in the north west of the Cotswolds. 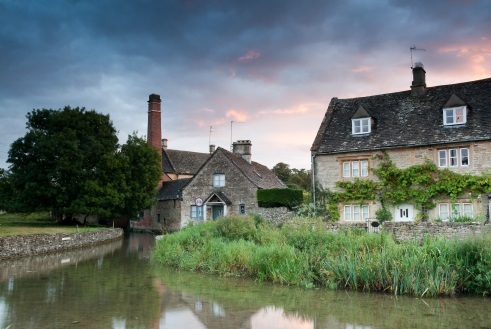 The rolling hills and grassland harbour, thatched medieval villages, churches and stately homes built of distinctive local yellow limestone make up The Cotswolds. The 102-mile Cotswold Way walking trail follows the Cotswold Edge escarpment from Bath in the south to Chipping Campden in the north. Below are a few of our favourite places to visit. 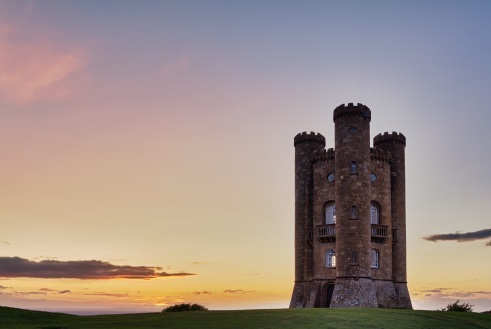 Broadway Tower - Broadway Tower was the brainchild of the great 18th Century landscape designer, Capability Brown. His vision was carried out for George William 6th Earl of Coventry with the help of renowned architect James Wyatt and completed in 1798. Cotswolds Distillery - The Cotswolds Distillery is the first-ever full-scale craft distillery within the Cotswolds Area of Outstanding Natural Beauty. Cotswold Lavender - We are a third generation family farm set in the Heart of the beautiful Cotswold Hills overlooking Broadway and the Vale of Evesham. Lavender was first planted here in 2000 in fields previously used to grow wheat and barley. 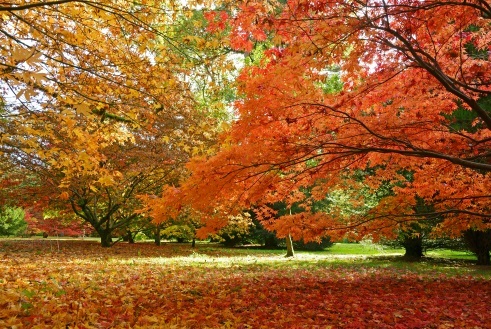 Batsford Arboretum - The 56 acre arboretum at Batsford is situated just a mile west of the historic market town of Moreton-in-Marsh in the heart of the Cotswolds. The Cotswold Falconry Centre is home to over 60 different species of Birds of Prey, with many breeding in front of you here at the Centre. Toddington Railway - The Gloucestershire Warwickshire Railway runs along a part of the former Great Western Railway's mainline from Birmingham to Cheltenham, via Stratford-upon-Avon. The line commands wonderful views of the sleepy hamlets and villages, as the it runs though the beautiful Cotswold countryside. 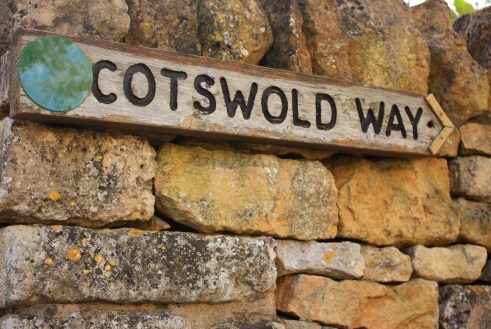 The Cotswold Way - The Cotswold Way offers just over 100 miles of magical walking, with long distance views from the Cotswold escarpment, and journeys through picturesque villages and past famous ancient sites. Horse Riding at Cotswolds Riding - With over 50 horses and ponies to suit any level of ability and challenge, people come from all over the UK and around the world to ride at Jill Carenza's. Set in the picturesque village of Stanton at the foot of the Cotswolds escarpment, riders can be up in the hills enjoying magnificent views on many miles of paths and bridleways, with virtually no roadwork. Cotswolds Clay Shooting - David has many years’ experience of both game and clay shooting and has taught thousands of guests the basics of the most rewarding of sports. Individuals, couples, small groups are catered for on a personal basis. Whilst larger groups and company days are taught by David himself and other equally qualified coaches. The lesson are relaxed and fun but also teach you the correct technique and safety to help if you wish to go further with shooting. Broadway Golf Club - Established in 1895 on an escarpment with wonderful views across the Vale of Evesham to the Malvern Hills & Black Mountains, Broadway is one of the finest members’ golf clubs in the Cotswolds. Partly designed by James Braid & Dr Alistair McKenzie of Augusta fame, careful use has been made of the natural contours with rolling fairways intersected by Cotswold dry-stone walls & undulating greens that test even the best of golfers. Cotswold Falconry Centre - Started in 1988, Cotswold Falconry houses around 150 Birds of Prey. Many can be seen during the free-flying demonstrations, while over thirty separate species have been bred in their successful but non-commercial breeding aviaries. The aim of the centre is to promote the greater understanding of birds of prey through education and fun.